It would not be a pleasant experience for me to outline the history of my childhood and youth. Let’s just say that it left me an emotional wreck. I wouldn’t say that it was all bad and had no joys, but I developed a fierce negative inner voice that wore me down. I call it the voice of the dragon. You might call it self-hatred or depression. Whatever the title, it constantly wore me down. I managed to do a lot of good things. but I always had this inner critic that vilified all that I tried to accomplish. The dragon would say things like “you fail at everything you do. You’re an incompetent idiot. You are not worthy of being loved.” When I could finally climb out of the mental and emotional hole, I pressed on to the next thing but the dragon always traveled with me. At a time of severe depression and self-hatred, I hit a real crisis. It was one of the deepest emotional pits that I ever inhabited. I became obsessive about a number of things and my behavior became destructive. This lasted for several years until I finally dragged myself to a cognitive therapist. She taught me how to combat the dragon. I realized that my thinking was disordered and untrue. I learned that the dragon used “hook words” to drag my thinking down the hole of despair. Hook words are absolute: words like always, never, completely, totally, etc. Absolute terms by nature seem undeniable, but they are also untrue. For example, when I would fail at something, the dragon would say, “You fail at everything you do.” My therapist showed me that the hook word, everything, was untrue. I fail sometimes and so does everyone else. Do I always fail? No. This therapy seems simple, but it is a battle, especially with the power of the voice of the dragon. Every time the thought came to me, I had to mentally and verbally say, “NO. That is not true,” over and over and over, even when I didn’t feel like saying it. At times when I did fail at something, the dragon roared back and I had to raise my shield to keep going. You think the Orthodox are repetitive in their prayers and liturgy? I guess I was Orthodox and didn’t know it. Sometimes, I just didn’t believe it would work. After all, I had spent years telling myself the “truth,” until I believed it. The idea was well entrenched in my psyche. As a result of this therapy, the voice of the dragon receded.. I learned that the dragon does not define my life. Despite the failure to reach my goals, along the way there has been a lot of love, a lot of new friends, a lot of significant ministry, and a lot of adventures. The journey itself was worth the effort. Given my past internal struggle, its a bit ironic that I have spent 20 years in a church that emphasizes repentance as a daily experience. A million times I have said, “Lord, have mercy on me, a sinner,” and also I stand before the congregation and say that I am “the chief of sinners.” The amazing thing is that I have never heard the voice of the dragon in my confessions. Marinating in Orthodox services for 20 years has changed much. 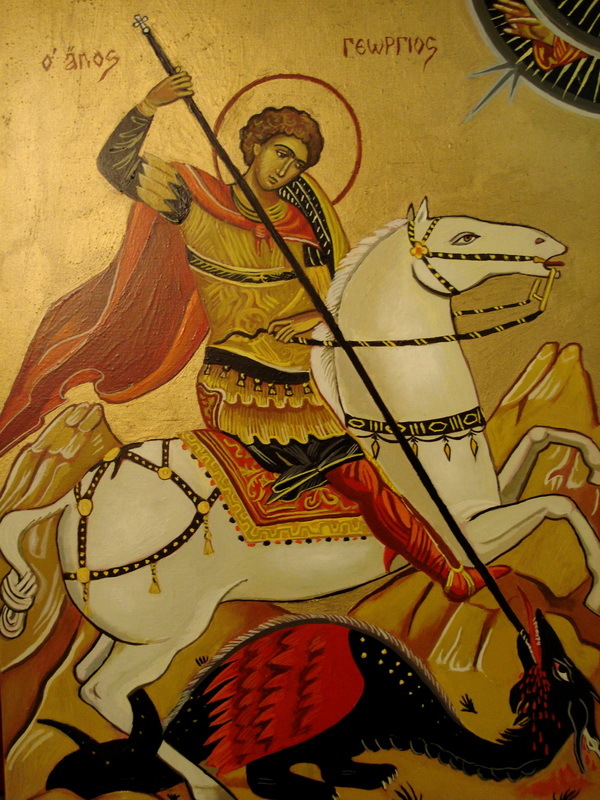 Repentance has given me the lance of St. George. That lance is inscribed with these words: “No one tells me who I am or what I am worth but the Lord Jesus.” No one defines me – not my parents, not my wife, not my children, not my teacher, not my priest, not my past failures, and especially not the voice of the dragon. Those who are baptized into Christ are the slaves of Christ. As Master, he tells us who we are and what we are to do. A slave cannot judge another slave. Only the Master can judge. A slave cannot even judge himself. I can judge my deeds to see if I have been obedient to Him, but I cannot judge my worth. This is what Jesus meant when he said that we should not judge. No matter how bad the behavior, we cannot see the inner life or the value of the person in front of us. Concerning deeds, it is impossible to see bad behavior and not know it as bad. Jesus will say to His disciples, “You will know a tree by its fruit.” Isn’t this being judgmental? Worth and value is one thing, deeds is another. When I repent, it is for the things I have done that are not in the will of my Master. I speak with the voice of the prodigal son. And even if I do not feel worthy to be His son, in the voice of the waiting Father, the voice of the dragon is not heard. You are currently browsing the Ramblings of a Redneck Priest blog archives for June, 2015.